Every one hates something. It’s good to let it out and even better to throw things at it. 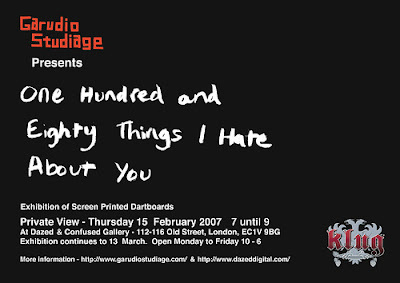 With 180 Things I Hate About You, Garudio Studiage gives you the chance to vent your anger and do just that! Eighteen of London’s most interesting artists have been invited to visualise their pet hates in the form of illustrations printed onto real dartboards. For one month only, the Dazed and Confused Gallery will become a playground for the public to throw darts at these works of art in this unique exhibition where the work meets play. Head down, throw shapes & darts at the Dazed Gallery open tonight from 7-9 and each weekday from 10-6. Some of the work can be viewed here.